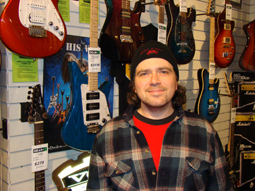 ANDREW @ Gear Music: Canada's Best Online Music Store! For the past 20 years musician Andrew Aldridge has been a fixture in the Canadian Music Scene as an in demand guitarist for many top Artists.His touring/recording credits include critically acclaimed artists such as Sarah Slean, Wild Strawberries,Universal Honey, Danny Michel, Jakalope, Oh Susanna, Lynn Miles, Melissa McClelland and many more.Along with studio recordings, Andrew has been featured on National/International live Releases and Broadcasts.Andrew is becoming more of an Internationally known musician having worked with Albert Bouchard (Blue Oyster Cult) and his band Blue Coupe, Chris Baron (The Spin Doctors) and Peter Stroud (Sheryl Crow). He has toured all throughout North America, Japan and Europe.Recently Andrew has been settling into the role of Producer - an album he produced just won an award at the 2013 Hamilton Music Awards. He has also been working along with lengendary engineer Nick Blagona (Deep Purple, The Bee Gees, April Wine, Tom Jones). Andrew has also been working with BOSS to create sounds and textures for the BOSS Tone Central website.